One of Plantronics most popular wireless headsets is the Plantronics CS540. The first thing to know about the CS540 is there are three variations of this headset. The standard CS540 headset allows you up to 38 units in one area without any distance loss or quality issues. There is also a CS540-XD model; the XD simply means it’s on a different frequency, so you can put more units in the same area without any issues. The third variation is the Plantronics CS545-XD. The CS545-XD wireless headset is on the same frequency as the CS540-XD, making it possible to use more units in one area. The only difference is the CS545-XD comes with an extra battery for longer talk time. The three CS540 variations function the same way and have the same features, other than the different frequency and an extra battery. What is unique about the CS540 series headsets compared with other wireless headsets is that they are convertible headsets, meaning they come with multiple wearing options. This feature also makes them very popular. You can wear the CS540 headset over the head with a headband, over your ear with an ear loop, or you can choose to wear it with a neck band that goes behind the head, so a very versatile wireless headset. 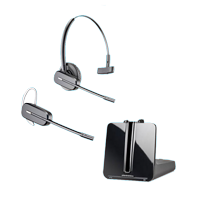 All three wearing options are included with each CS540 series headset. With the over-the-head wearing option, you get a soft leatherette ear cushion that rests against your ear. The headband has a temple pad on one side that holds the headband snug against your head, so the headset won’t move or come loose. The headband is adjustable, so you will get a really good, stable fit. If you choose the over-the-ear option, it’s very lightweight at just 21 grams and very quick and easy to put on. This option is very low profile, so when you are face to face with people, they won’t really notice that you’re wearing a headset. The over-the-ear configuration has an ear loop that goes around your ear, and an ear bud that goes into the ear. The Plantronics CS540 wireless headset comes with three different size ear buds, so you can find one that fits you for a good comfortable fit. It also includes a foam pad you can put on the ear loop, so a little extra comfort for all-day wearing. It comes with a noise-canceling microphone, which is very important because it targets your voice and cuts down on background noise. For the best mic positioning, ideally you want the mic about a quarter of an inch away from your mouth. You will get seven hours of talk time with the CS540 and CS540-XD headsets. The CS545-XD headset gives you unlimited talk time with the extra swappable battery. You will get up to 350 feet of range with all three variations of the headset. The range is very important, because that is one of the major benefits of using a wireless headset. When you use a corded headset, you get hands-free communication, so you can write or type while taking calls. But when you use a wireless headset, like the CS540, you take it up a notch, because now you can write and type hands free, but you also have the freedom to move around your office doing other chores, while still taking calls. You will be able to get a lot more done by multitasking while answering calls. It is a little bit more money for a wireless headset, but you will gain a lot in productivity and convenience. Now you will be able to grab a file or walk to another room while continuing your conversation. One important item to consider when purchasing a wireless headset is purchasing a lifter or EHS cable at the same time. Adding a lifter or EHS cable takes it up another notch. With one of those accessories, you don’t have to run back to your phone to answer or hang up calls; you can keep doing whatever you were doing elsewhere in your office. You will be able to answer and hang up calls with a push of a button on your headset. You will also get call alerts; when you have an incoming call, you will get beeps in your headset altering you to the call. So you won’t miss calls to voicemail or play phone tag. The Plantronics CS540 headset has several buttons on the headset. One is a volume control that toggles up and down. There is also a mute button, so you can walk up to a coworker, mute the call, ask a question, press the mute button again, and you are back on with your caller. A really great productivity booster. When you are done at the end of the day, you just put the headset in the base unit and let it recharge overnight. There is a magnet in the base, so the headset locks in firmly, so you know you will get a good charge and be ready to go the next day. The base of the CS540 headset is the brains of the unit; that is what plugs into your phone. The base has a compatibility slide that makes the headset work on almost any model phone currently out there. There is also a volume control for the mic and the speaker on the base. The CS540 wireless headset is made for the average-to-quiet office environment. You will be much more productive with a wireless headset like the CS540. The Plantronics CS540 will fit you so comfortably you will be able to use it all day, every day. If you have questions on this or any other model, please give us a call at 1-800-914-7996, or visit us online at www.headsetsdirect.com.